I was looking for a good book to buy for one of my friends who likes reading about history and medicine, and I remembered The Ghost Map, a book that many of the people I follow on LibraryThing read and loved. One of my pet peeves is buying someone a book that I don’t own myself, so I also bought myself a copy and read it when I was looking for a break from speculative fiction. The Ghost Map is about the terrible Broad Street cholera epidemic in London in 1854. The epidemic claimed over six hundred lives, but also sparked an investigation that led to the foundations of the science of epidemiology and underscored the importance of proper sanitation and public health. We follow two investigators – local doctor John Snow, who had been looking for more data on cholera for a long time, and young assistant curate Henry Whitehead, who was increasingly concerned about his parishioners being decimated. Whitehead’s local knowledge and Snow’s methodical nature and medical skills combined helped prove that cholera was spread via contaminated water, rather than the ineffable “miasma” that was the prevailing theory of the time. This book was well-written and well-researched, but I was far more compelled by the first half of the book. The author plops you down in the sights, smells, and sounds of Victorian London as he sets the stage for the start of the epidemic, and it’s pretty amazing. You really get a sense of what it was like for the residents of Broad Street, much of it is familiar, and the unfamiliar parts are explained with full context. However, once the investigation gets underway, it felt like there wasn’t a full book length of material there, and the author was trying to stretch it in creative ways. He talks up the opposing viewpoints of Whitehead and Snow, but there’s no drama there – Snow had the evidence, and Whitehead was convinced by it. Some of the later material also seemed a little repetitive. And occasionally the author goes on tangents where he draws conclusions that didn’t really matter to the narrative, but worse, didn’t seem backed up by anything (I checked the citations) – one example being alcoholism as an evolutionary predilection for some races of people. The conclusion of the book was also somewhat weak, there was a bunch of tangential stuff about the various things maps are useful for, and the connection to the cholera outbreak map was extremely tenuous. The author also takes the opportunity to advocate strongly for his belief that humans should be striving for urbanization, which also didn’t seem connected to the rest of the book other than the fact that London is a city. 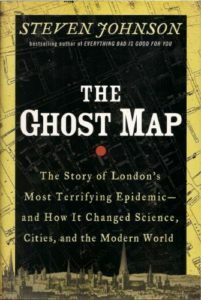 Overall, I’d recommend this book for its engaging portrayal of what it was like to live in 1854 London and to learn more about how humanity started making meaningful progress into investigating and managing epidemics. It’s definitely a popular non-fiction book though, and prioritizes shock value over thoroughness. This entry was posted in Books, Reviews and tagged history, medicine, non-fiction by Kriti Godey. Bookmark the permalink.